Store the strips in their original packaging at room temperature. This product is stable for up to 18 months from the certified date. Freezing the strips is not recommended. 5 minute determination of 6 Rat Ig heavy chain isotypes and 2 light chain subclasses: IgG1, IgG2a, IgG2b, IgG2c, IgA, IgM, kappa, and lambda. The Rat Immunoglobulin Isotyping Rapid Kit is a five-minute lateral flow assay with ELISA sensitivity for monoclonal antibody class and subclass determination. Acceptable sample types include hybridoma culture supernatant and purified monoclonal antibody. Ascites fluid is not recommended since it usually contains multiple immunoglobulins. However, this kit can still be used to determine the relative distribution of the main isotypes in a sample of ascites fluid. The isotyping kit has three different sizes with 5, 10 or 20 pouches containing two cassettes per pouch: one cassette is for determining IgG1, IgG2a, IgG2b, IgG2c and the other cassette is for determining Kappa, Lambda, IgA and IgM. Both strips contain a control line. Recommended dilution is 1:10-1:100 in PBS. Dilute samples to 0.5 -2 μg/mL in PBS. Ascites fluid is not recommended since it usually contains multiple Igs. However, this kit can still be used to determine the relative distribution of the main isotypes in a sample of ascites fluid. The recommended dilution is 1:10,000 in PBS. 1. Place the cassettes in horizontal plane. 2. Add 80-100 μL antibody solution directly to the Sample Well. Wait for 5 minutes. 3. A red test line at the location corresponding to antibody-specific isotype and a red control line at "C" position will appear within 1-5 minutes. (1) Do not read after 20 minutes. 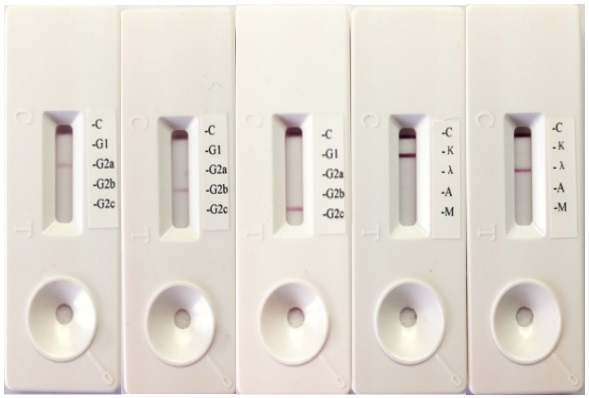 (2) If the color of tissue culture medium causes high background, 40-60 μL PBS can be chased to clear the background. (3) Promptly return unused strips in their original bag and keep dry. 1. Invalid result: no red line at "C". 2. Negative result: only one red line at "C". a). Single monoclonal antibody: In addition to the positive control "C" line, only one heavy chain and one light chain will appear. b). Multiple monoclonal antibodies: In addition to the positive control line, more than one heavy chain and/or one light chain will appear. The line intensity can be used to judge the dominant isotypes. Minimum detectable concentration is 100 ng/mL. There is no cross-reactivity among each isotype. Have you cited CDXPH004 in a publication? Let us know and earn a reward for your research.